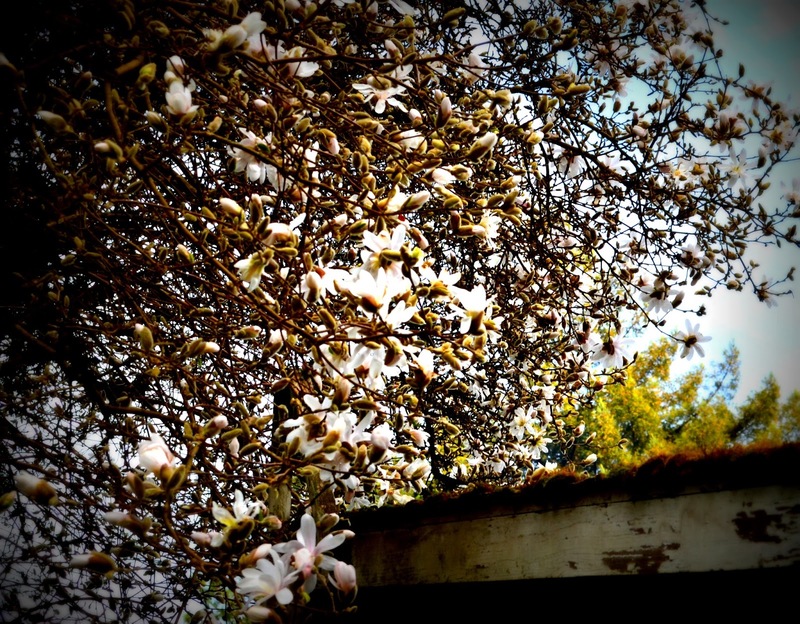 March Bloom Day has arrived! Here in Oregon, we have experienced a very mild March thus far, with more dry days than wet. Quite unusual. (No complaints!!) It has brought out many a bloom and my spirit feels invigorated with all the 'dirt' time I've been able to comfortably enjoy. Helleborus Spring Promise 'Elly' A gorgeous, frilly, double Hellebore. 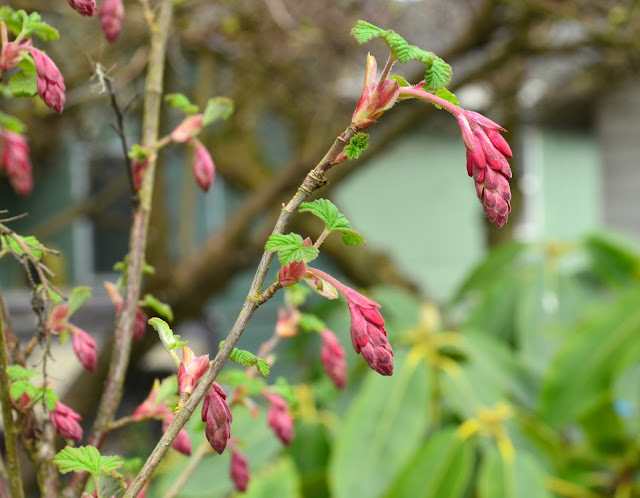 Last year on the recommendation of fellow garden blogger Catherine, from A Gardener in Progress, I purchased a Flowering Currant. I am enjoying the scents and blooms right now! 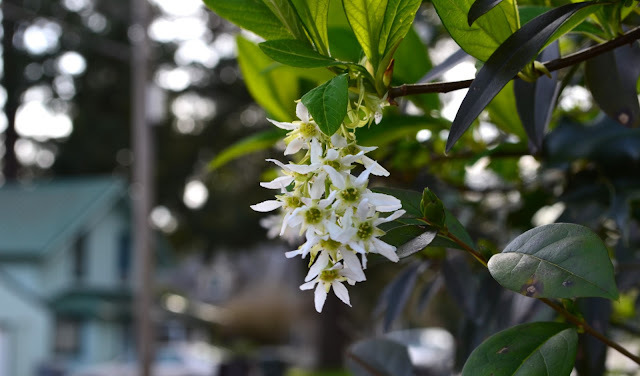 I found this white flower bush, jammed into the front of the hedge of Laurel. It dawned on me that it might also be a flower current as it is blooming at the same time as the King Edward, VII. What do you think? I have transferred quite a few plants from my former residence. These Candy Tufts are doing well in their new home. 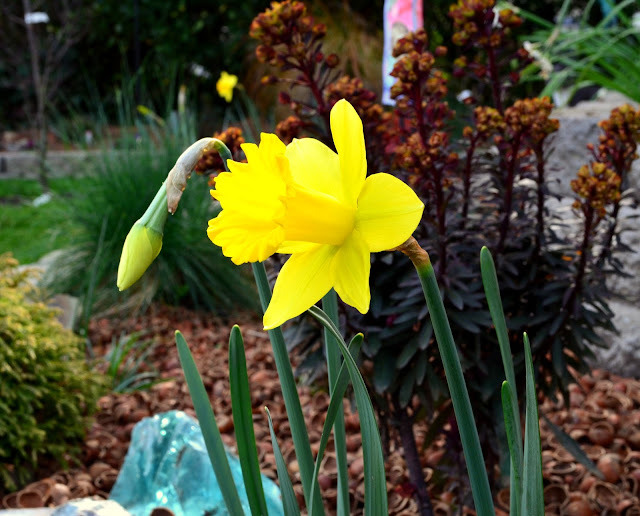 Daffodils, planted last fall in my new front flower beds are just beginning to open. What spring bulb garden would be complete without dainty, tete a tete daffodils? And finally, in just the past 3 days our ancient, Star Magnolia, has begun to burst open with blooms. It is quite a sight. I will count myself fortunate if we are lucky enough to receive future sunny days this month. Traditionally, March brings with it a slog of rainfall, making it one of my least favorite months. However, I cannot say that this year. It has been extremely pleasant. Visit May Dreams Garden to join garden bloggers around the world celebrating this month's blooms. Charlotte and Elly are new for me this year too. 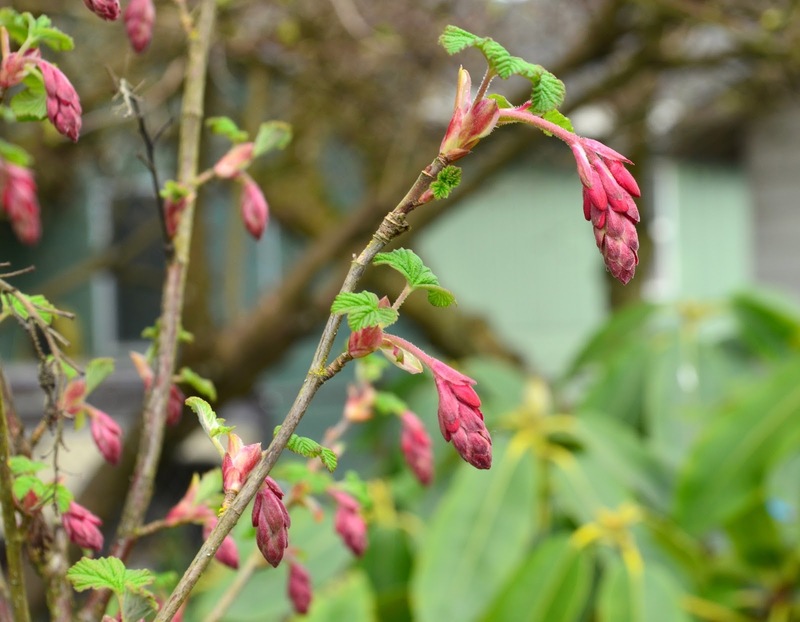 I'm glad to see you bought a red flowering currant, my absolute favorite native shrub! 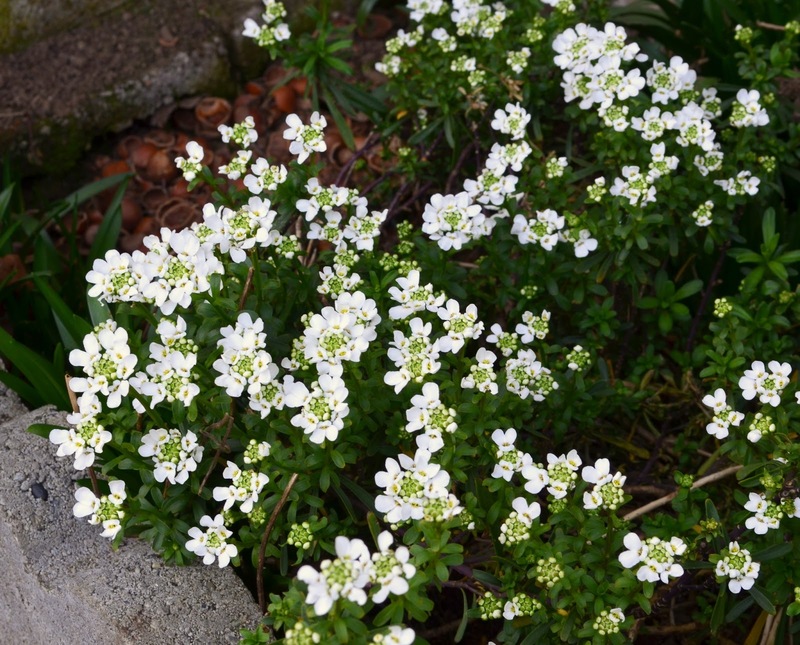 Once established, it is very drought-tolerant over the summer. I love the Indian plum too! Beautiful blooms! I'm kicking myself for not buying Charlotte at the flower show. Oh well, I coul always just go to the nursery in person... Happy GBBD! You do have some lovely blooms on show right now. 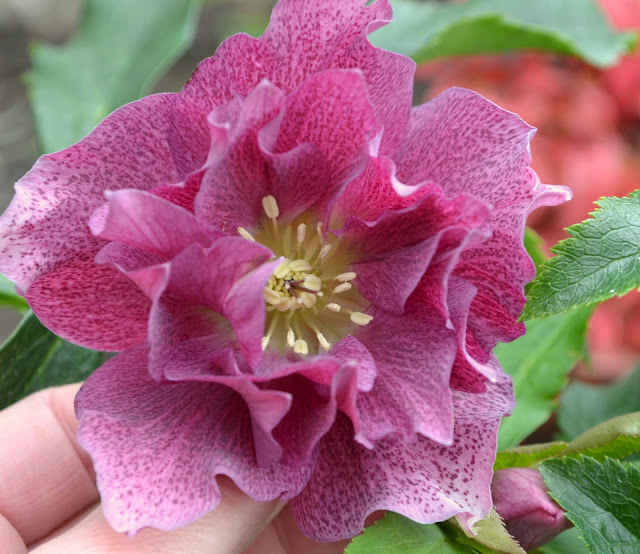 The Hellebores are gorgeous, and I loved the Flowering Currant. Here's hoping your pleasant March weather continues for a while yet. I think the magnolia is my favorite, I wish I had room in my garden for 3 or 4 more! Your Helleborus are are beautiful! I love those different colors...I have a plain white one, and it's pretty, but doesn't hold a candle to the ones you have pictured! Great photos. I love your Hellebores, wish I could grow them here, but alas. 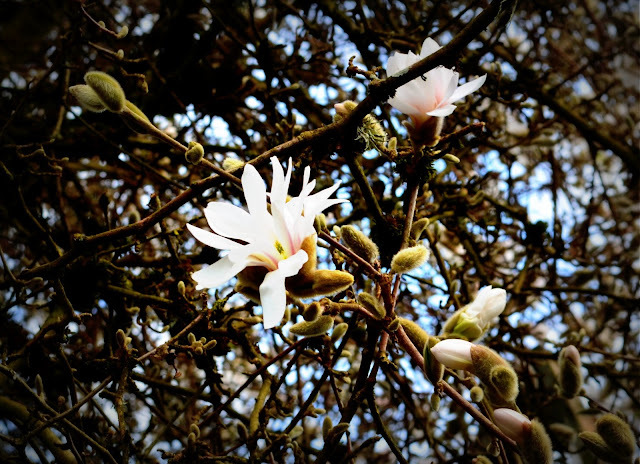 How wonderful to see everything starting to break forth from winters' slumber and burst into bloom. Jenni your garden is so pretty! I love seeing all the different types of Hellebores. I'm glad you're happy with the Flowering Currant. It really is one of my favorites! King Edward is a really great one, it blooms earlier than my other unnamed one, and the flowers are such a pretty pink. Wait til the hummingbirds find it. I'm almost afraid to say much about the March weather. Even on the "rainy" days it hasn't been that bad. Such pretty hellebores! Charlotte and Elly are gorgeous, I have some hellebores myself but I have added these two girls to my ever-growing wish list. March is a topsy-turvy month in terms of weather here in London too, anything can happen really, but this year it has just been one this so far and that has been cold! I love hellebores, too, and those sure are pretty! I think I like 'Valerie' the best of the ones you showed. I wish I could remember the names of mine, or that the tags would stay put. I enjoyed your other blooms, too, and look forward to spring progressing. Thanks for your comment on my blog. That 71 degree day gave in to a cold front, and after a couple days only in the 30s, we are now having 40s. Tuesday looks like a 50 degree day. I hope to get back out there after work Tuesday to do more clean up. I've now been allowed in! The hellebores are beautiful but we envy you your warm and sunny March. April isn't forecast to be going to be much better than March has been so far for us which is bad news. 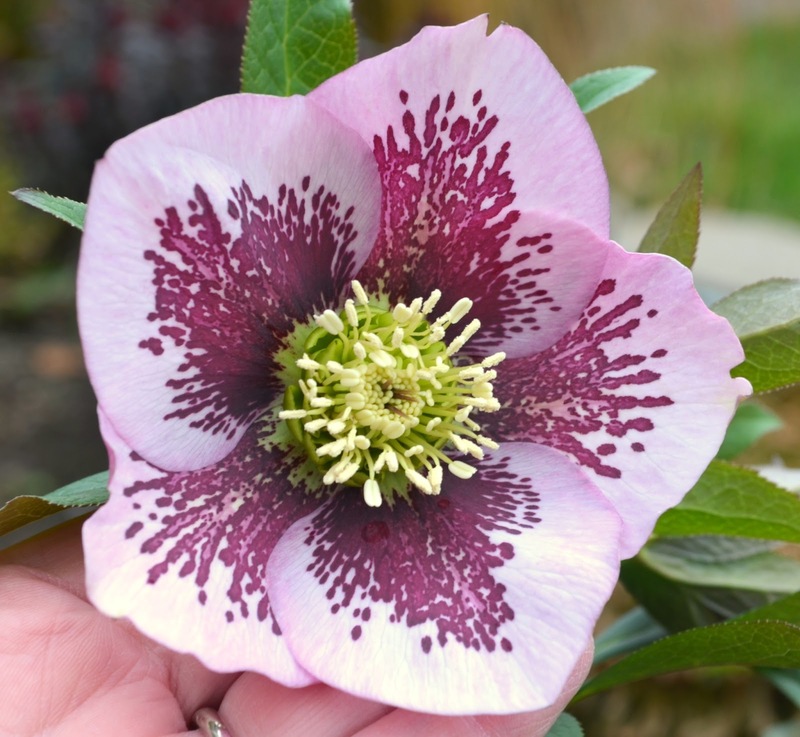 Jenni, with your love of hellebores and your location in Oregon, have you made it to the Northwest Garden Nursery hellebore sale in Feb? The O'Byrnes own that nursery and are respected hellebore breeders. Quite a fun gathering for hellebore addicts! A couple of years ago I flew in from Spokane and lugged 6 hellebores home with me on the plane. 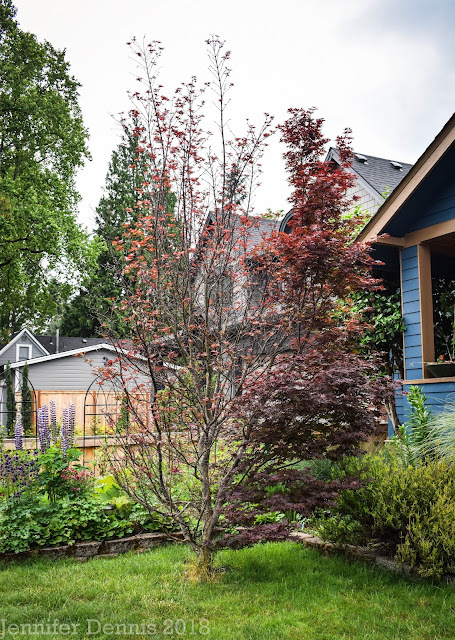 I hope you get enough rain to keep the garden happy and enough sun to keep the gardener happy! Lovely hellebores! I have heard it said that an interest in hellebores shows maturity in a gardener, but the fact is anyone can appreciate and grow these fascinating plants. 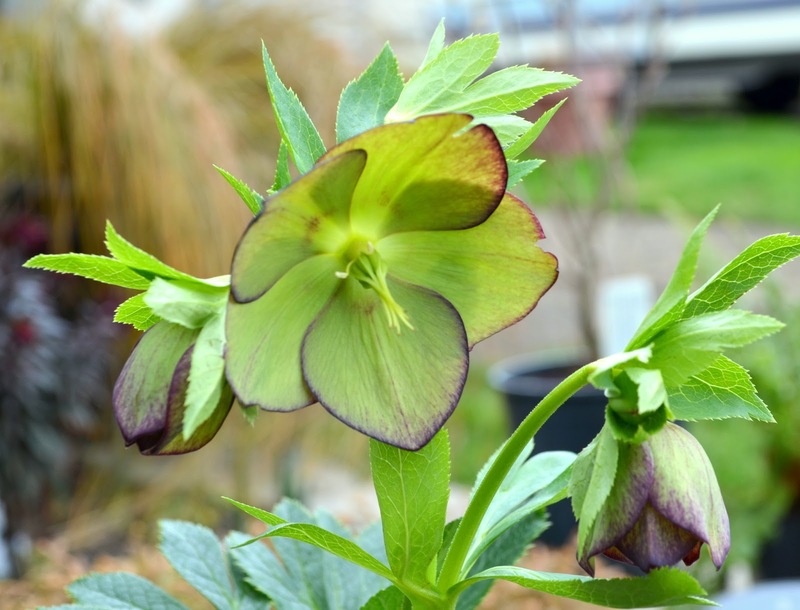 The Hellebore photos are fantastic. The look of Spring is lovely. Life is much better when you see nature at its very best—case in point, look at those flowers. 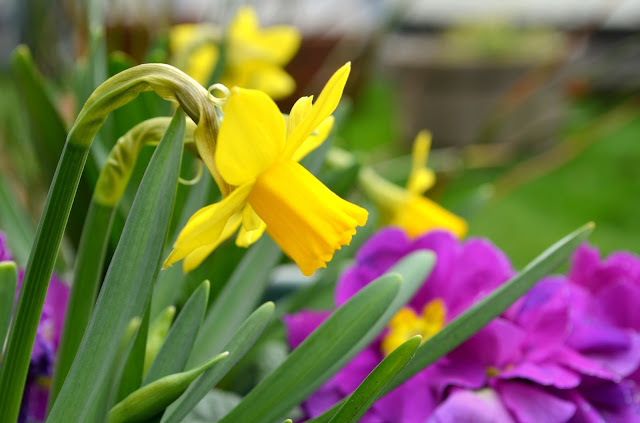 Those full-bloomed daffodils are gorgeous. Oh, I also love the ever-frilly Hellebore! Thanks for compiling these truly inspiring pictures. Cheers!